We offer convenience and security for both drivers and passengers through our automated fare payment Taxi Card system. 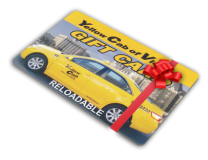 Our innovative card solution can be used to pay for any trip you take in a Yellow Cab in Greater Victoria. No limit on the cards and can be bought at our office only in person.